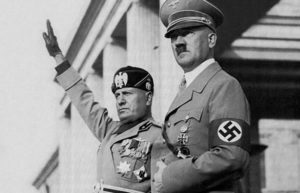 Parati will tell the history of fascism and its roots in Italy in 1919, and explore similarities and differences in the fascist regimes of Adolf Hitler and Francisco Franco. Parati is the Paul D. Paganucci Professor of Italian Literature and Language and the Director of the Leslie Center for the Humanities at Dartmouth College. She has published several books in her fields of scholarship, including Public History, Private Stories: Italian Women’s Autobiography; Mediterranean Crossroads: Migration Literature in Italy; Italy and The Cultural Politics of WWI; and Migrants Writers and Urban Space in Italy: Proximities and Affect in Literature and Film. She has published articles that focus primarily on migration issues. The Vermont Humanities Council’s First Wednesdays series is held on the first Wednesday of every month from October through May in nine communities statewide, featuring speakers of national and regional renown. Talks in Newport are held at Goodrich Memorial Library. All First Wednesdays talks are free and open to the public. See the full schedule of Newport First Wednesdays talks. The statewide underwriters for the First Wednesdays 2018-2019 series are The Alma Gibbs Donchian Foundation, the Windham Foundation, and the Institute of Museum & Library Services through the Vermont Department of Libraries. Goodrich Memorial Library is sponsored by Community National Bank. The Vermont Humanities Council seeks to engage all Vermonters in the world of ideas, foster a culture of thoughtfulness, and inspire a lifelong love of reading and learning. Because Ideas Matter.